I had a real surprise today! I got a text from my publisher, saying Four More You Say Which Way Adventures is live as a box set on Amazon today! Dinosaurs, dragons, pirates, wild dogs, monsters, weird divers and a spooky house – all in one boxed set. Kids will have hours of fun exploring Four More YSWW Adventures and finding lots of cool endings. Be the hero in your own story with You Say Which Way. Dragon Tales is live on Amazon! Happy New Year! Well, we finally got here. 2015 is fading and 2016 beckons on the horizon. This has been a hectic year, and the holiday season has been no exception! My latest book, Dragon Tales, has just been released by Phantom Feather Press. Dragon Tales, a collection of dragon-themed stories for kids, will be at a special introductory price of $0.99 for the next few days, so family and friends can grab a bargain before the price goes up. Available on Amazon. Whether you’re looking for a nip, a nibble, or a chomp-sized story, wing your way to an adventure with Dragon Tales. Dragon, dragons and more dragons… modern dragons, medieval dragons and dragons in unexpected places! The full Dragon Tales blurb is here. I wish you a happy start to the New Year and a great 2016. May many great books come your way! If you’d like to know when my new books are out, sign up for reader updates! I know this is naughty, very naughty, but I just cant help the victory dance, the evil maniacal laughter or the sly grin breaking across my face!! I beat Rick Riordan! Dragons Realm shot past two of his books on the Amazon charts! Yes! Yes! Yes! I beat Rick Riordan! The giant of kid’s fiction.The hero of middle grade and young adult readers! The inventor of Percy Jackson!!!! My kids worship him, and (ahem) so do I.
Wow! I was gobsmacked last week to get to #3 in kid’s interactive fiction, with his book sitting right above mine, but WOW, now Dragons Realm is above TWO of his books! Okay, okay, Amazon rankings change hourly, so it may be short-lived glory, but let’s celebrate while we can… I’m not deluded, it won’t last long, but here is the moment immortalized by a screenshot! So when I’m an elderly granny in my rocker on a space shuttle bound for somewhere, (funny image that – a rocker floating around in zero gravity with granny’s knitting needles flying around in a tangle of wobbling wool) I can glance at the antique screenshot and smile and, by then, no one except me will remember who Rick or Eileen are! But I will! And cackle hysterically! I beat Rick Riordan, just for a small moment in time. You can purchase Dragons Realm on Amazon, but be quick, the special introductory price of 99c won’t stay this low for long. Just a few hours after its release, Dragons Realm hit #3 on Amazon’s bestseller list for children’s interactive adventure stories. Check out Dragons Realm here. Dragons Realm has done well on Amazon, thanks to all my cool readers. Here are the statistics for the three categories of kids books that Dragons Realm sits in. Have fun flying your dragon, training dragonets and encountering unusual people and strange creatures in a world where you say which way the story goes. Thank you to all my loyal readers for your support! Dragons Realm is available here if you’d like a copy. Its a You Say Which Way adventure, so have fun saying which way the story goes. Watch out for strange creatures lurking in Spanglewood Forest. And don’t let go of your picnic lunch! It may come in handy! I’m excited to announce that my middle-grade novel, Dragon’s Realm, for 8-12 year-old children, will be out in before Christmas this year. You Say Which Way is a great series of stories in which you choose the adventure you want. These interactive e-books are similar to the old “Choose Your Own Adventure” or “Pick a Path” stories we used to read when we were younger, but even BETTER! In You Say Which Way there’s a new adventure on every page, and a multitude of cool endings to reach! The choices you make are meaningful and change the outcome of your story. You write your own story with your choices. 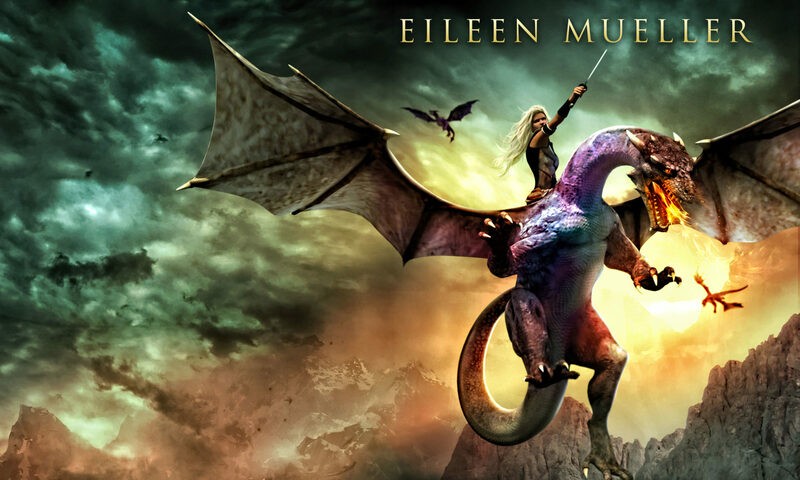 Eileen Mueller’s title Dragon’s Realm will join the You Say Which Way series on Amazon soon. 5 reasons why rewriting a novel is tough! Rewriting a novel can be especially tough when time has passed, and your craft has been honed since you wrote those old words. Rewriting a novel can be tough when you changed major plot elements mid-novel, and thought you’d fix them later. And later is now! Rewriting a novel is tough when you want to cut a whole lot of words. Thousands. Perhaps tens of thousands. Rewriting can be tough when you want to change a character’s voice. Rewriting can be tough when you have a job, a family and a thousand other story ideas that would be easier, because writing new words is often more appealing than editing old ones. Eileen has finished rewriting a novel! 6 ways to tell that rewriting is a Success! Rewriting is a success when you LOVE the new novel. Rewriting is a success when your characters’ voices, motivations and personalities are clearer, crisper, and sing to you from the page. Rewriting is a success when the manuscript just begs to be read! And begs. And begs, no matter how busy you are. Rewriting is a success when your beta readers (from your target audience) drool over the first few chapters, then plead to read the rest! Then offer to buy the book before it’s out. Rewriting is a success when your story is done, well and truly re-plotted, restructured, polished, edited, and done, done, done. Stephen King mentions that rewriting is successful when you’ve cut at least 10% from your work. If you’ve cut even more, you’re on the right track! So what was I rewriting? The YA paranormal romance that has been simmering on the back burner for a while. It’s done, and it’s great. Watch this space. WOW! I never expected this! I just got an amazing Christmas gift! Let me share it with you. I am absolutely thrilled to let you know that my first solo audio-book as been released. With great narration, a top notch music, and its own fun cover. This project was a spontaneous suggestion from one of my readers and I am blown away at how it happened—and at the amazing audio-story that’s been created. Fairy Lights is a short Christmas tale for children and adults and is available here! A great Christmas present. Now, let me tell you how this top-quality audio book was made—complete with its own musical score and cover, both created by talented people! Phantom Feather Press, a small independent publisher, launched The Best of Twisty Christmas Tales on 13 November 2014 at The Children’s Bookshop in Wellington. The launch was amazing with around 120 people attending, and authors flying in from all around New Zealand. On the way home, I received a text from Sasha, a teenager who had attended the launch. Hey, just wanted to let u know… I’ve read ur stories and they are fantastic!!!! Thank you. You’re so sweet. Her Mum then told me a few days later that the story had touched their family. A couple of weeks later, Sasha’s Dad, Charles—a singing teacher and voice-over artist—contacted me, suggesting we create an audio book. Phantom Feather Press agreed, as long as we mentioned The Best of Twisty Christmas Tales. Charles recorded the story beautifully—no mean feat—and told me Giacomo, a musician in Canada, was interested in creating a musical score for Fairy Lights, and Bythe, an Australian artist was also keen to create Fairy Lights cover art. When the music arrived, it blew me away. I was so humbled that a musician would create such an incredible arrangement for my story. Giacomo’s music swept me along on an emotional journey—started by my wee story, enhanced by a musical-score that sounds like a movie sound track, and gift-wrapped in by a cover from a talented artist. Pop over here and listen to the preview. I hope you enjoy Fairy Lights as much as I have. If Fairy Lights is popular, Charles, Giacomo, Blythe and I would love to work together again. Check out this link to find out what Fairy Lights is about. A special thank you to Charles Humphreys, Giacomo Cataldo and Blythe Thompson for making one of my dreams come true and giving me the best Christmas gift ever! And thank you to you, my readers, for listening to Fairy Lights. Your love and trust is also a fabulous Christmas gift. I wish you a warm and loving Christmas and a great start to the New Year.